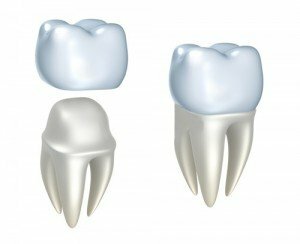 Dental crowns and inlays or onlays are different dental treatments which are united in one purpose, and that is to protect your teeth from being damaged further. Some teeth need full or partial coverage of the tooth structure to preserve them. Due to some instances such as fractured tooth, too large filling, or excessive decay underneath the filling, your dentist may require you to have a complete coverage dental crown or inlay/onlay tooth restorations. Both allow the patients to maintain more natural tooth structure. Decay underneath a crowned tooth. Cavities can still enter the tooth regardless of its restoration. They appear at the junction of the crown and tooth near the gum line. Inefficient bonding of cement that holds the restoration. Contamination of the cement during the procedure is the closest reason why this incident usually happens. Eating too many chewy foods can gradually affect the treated tooth. Your dental crown or inlay/onlay can be pulled off by sticky food. Formation of a crack around the tooth due to much force being used. Abusing your dental crown or inlay/only such as using it as a tool. Not enough tooth structure for the dental crown to hold on to. This case is common in back teeth that are short and worn down throughout years. Going to the dentist is the most important step that you should do when your crown or inlay/onlay has come off. In doing this, your dentist can permanently bond the affected treatment back to its original tooth structure. Before permanently re-cementing the crown or inlay/onlay, your dentist will disinfect the area properly to avoid the access of bacteria within the treatment. Losing your crown or inlay/onlay restorations could bring risks to your health. Before it’s too late to rescue your teeth and your dental restorations, consult your trusted Brisbane dentist immediately. Make an appointment with us, here at Precision Dental. We provide extensive and urgent treatment for small and big dental emergencies with the assistance of our proficient dental team and high-end dental equipment. Call us today on (07) 3852 1160 or book an appointment online.